Back in early 2013 the school board decided they wanted to issue a Capital Appreciation Bond (CAB). A CAB would pay for the $11,998,678.35 expense to design and build Havens but at a total taxpayer liability of $63,995,000. The extraordinary interest charge was levied because the scheme deferred taxes until beginning in 2027 --but interest kept compounding from 2013 onward. These details were not disclosed to the public prior to the bond issuance but a hint leaked in a board line item after issuance. I dug deeper and found out the full nature of the scheme. 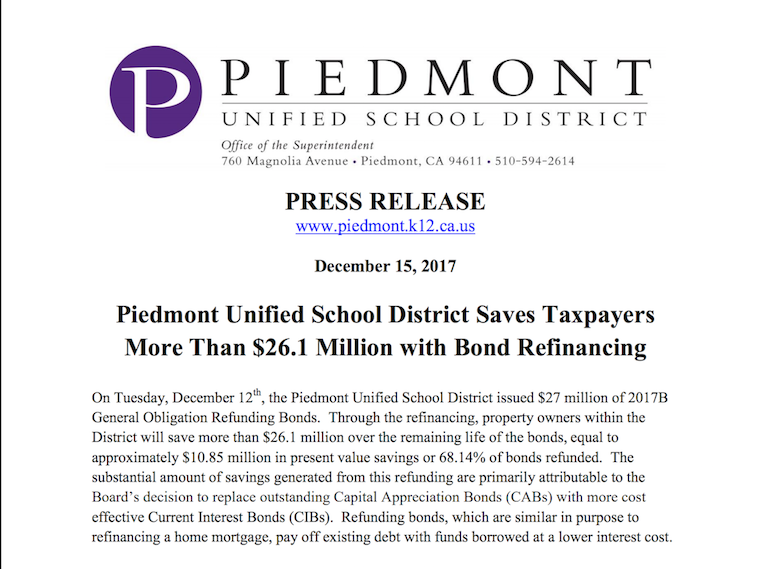 Since 2013 many in Piedmont including myself have pointed out that Current Interest Bonds (CIBs) have a lower total tax liability (a.k.a. total repayment cost) than CABs by simply avoiding compound interest charges. Many letters were written to the school board, were published in the Piedmont Post and appeared on my website. I estimated that if the school board had gone to the voters and issued a CIB in 2013 instead, it would have had a total tax liability of only $19.2 million. KNN Public Finance (hired by the school board) confirmed a CIB could have been issued in 2013 but has denied any wrongdoing in issuing the CAB, citing that their present value calculations show no harm from the issuance and stating the school board passed the bond believing that many Piedmonters could not afford to pay additional property taxes from a “pay as you go” system like CIBs. The school board continued to consider a CAB as their first choice for Measure H in 2014 as well as refinancing the 2013 CAB in 2017 and left the possibility open for Measure H1 refinances down the road. In late 2017 in response to a survey the school board got the message that their constituents did not want to keep the CAB issued in 2013 and that a refinance to a CIB was the preferred way to proceed. Although technically the 2013 CAB cannot be refinanced until 2023, KNN found a way to lock in today’s interest rates by adding $3.5 million in interest expenses until 2023. Per KNN, net of this new interest expense the refinance will reduce the $64 million tax liability down to $38 million, a $26 million saving in total tax liability. Beginning in 2023 Piedmont taxpayers will start paying for Havens when the CAB converts to a CIB. By 2023 the property taxes for all bonds (including H1) is anticipated to be $150 / $100,000 in then assessed valuation. What happened to the additional $18.8 million (= $38 million - $19.2 million) savings had we issued a CIB in 2013? That money is lost to compound interest due to the 10 year lock-in period preventing any refinancing of the original 2013 CAB. This CAB was issued in secrecy, outside the view of the public. How can we prevent this from happening again? We could ban bonds from being issued which utilize compound interest or zero coupon bonds (e.g. CABs) unless the public failed to fund that project with a current interest bond. KNN is using software written by DBC Finance, essentially pushing buttons to produce canned reports. KNN doesn't know the mathematical assumptions behind that software. For example KNN cannot explain the arbitrage behind their assumption of 3.1% for the time value of money (TVM) in their present value calculations. The present value for whom? The bond investor or the Piedmont taxpayer? In 2014 KNN admitted it was for the Piedmont taxpayer, now KNN is stating there is no difference as the arbitrage yield (a.k.a. discount rate) is independent of the observer. The district did eventually focus on reduction of total tax liability but only after both Bill and I spoke against using KNN's present values. We don't elect school board members who independently do the math nor do they hire support staff or can provide oversight of KNN and explain their mathematical assumptions. Community "experts" like Bill Hosler and myself have tried to provide advice to the board, however the board was taken for a ride by KNN. For example KNN insisted that they knew the interest rates would be higher 5 years from now. Their advice was only appropriate if the interest rates have a sustained rise by at least 70 basis points. If rates fall instead, we would have spent $3.5 million in interest charges unnecessarily. Bill and I caught numerous problems with the KNN presentation, some of which KNN fixed and others which KNN ignored - saying "that's how the industry does it". Why does the process rely on "community experts" to provide oversight of KNN?